Seeking safety, Diana and Matthew travel back in time to London, 1590. But they soon realize that the past may not provide a haven. Reclaiming his former identity as poet and spy for Queen Elizabeth, the vampire falls back in with a group of radicals known as the School of Night. Many are unruly daemons, the creative minds of the age, including playwright Christopher Marlowe and mathematician Thomas Harriot. Shadow of Night by Deborah Harkness is the second book in the All Souls Trilogy. The main characters are Diana Bishop, a witch and Oxford scholar, and the vampire geneticist Matthew Clairmont. The setting is Elizabethan London, where as Diana and Matthew search for Ashmole 782, an enchanted manuscript, they find some of Matthew’s friends, members of the School of Night are involved, and become tangled in alchemy, magic, and spycraft. The more annoying characteristics of Matthew and Diana that weren't very noticeable in the first book, such as Diana’s tendency to want to do things without listening to advice, and Matthew sometimes being snobbish and distant are magnified to absurd levels. It gets to a point where they are literally not listening to a word the other says, and the entire book feels like a combination of a long-running argument and time-jumping sightseeing trip. Another thing to note is that the author does use historical figures in her story, making them characters in the plot. If that’s something that bothers readers, they will have to weigh whether or not the story makes it worth overlooking that element. At times it felt as if the author was trying to cram far too much information in, rather than advancing the plot in any way. This gets frustrating fast, and made the story feel weaker as a result. A further issue is the fact that there are a number of rather large plot holes, which should have been wrapped up, addressed, or otherwise filled during the course of Shadow of Night, but for some reason, were left to hang like loose threads. 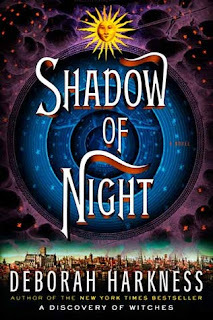 As far as being the second installment in a series, Shadow of Night does pick up the pace a bit, but is still not a strong enough book that it could be recommended without having read the first volume, and is in need of another edit, or at least a lot of explanation in the next book.